Saquon Barkley keeps racking up yards and touchdowns while Penn State keeps winning. But the star running back has company in the Heisman Trophy race because Bryce Love and Baker Mayfield are also putting up big numbers. Speaking of company, nobody is favored against the rest of the field in a crowded NFC South. Saquon Barkley (-140) -Barkley torched Michigan to the tune of 161 yards from scrimmage and three total touchdowns during the Nittany Lions' 42-13 victory last Saturday night. Barkley now has 757 rushing yards, a career-high 448 receiving yards, and 11 TDs through seven games for undefeated Penn State. Bryce Love (+200) -No Christian McCaffrey, no problem. With McCaffrey having taken his talents to the NFL, Stanford's backfield belongs to Love. And he is loving it, without question. The junior from Wake Forest, N.C. has a ridiculous 1,387 rushing yards to go along with 11 touchdowns through seven games this season. 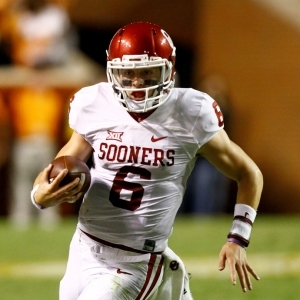 Baker Mayfield (+700) -Mayfield has helped Oklahoma recover from a home loss to Iowa State by picking up road wins over Texas and Kansas State. The senior passed for 302 yards and two touchdowns against the Longhorns before accounting for four total scores (two passing, two rushing) at the Wildcats' expense. J.T. Barrett (+800) -Barrett has been around forever, and he appears to be going out with a bang. The Ohio State senior has thrown 18 touchdowns and zero interceptions since the Buckeyes' Sept. 9 loss to Oklahoma. There is a huge gap after Barrett, with Oklahoma State quarterback Mason Rudolph coming in as the fifth favorite at +2000. New Orleans Saints (+125) -In two divisions (the NFC South and the AFC South) the current favorite is an underdog against the rest of the field. In the NFC South, New Orleans is a +125 top choice; in the AFC South, Tennessee is No. 1 at +150. The Saints (4-2) have won four straight games-including at Carolina and at Green Bay. Atlanta Falcons (+175) -Atlanta briefly silenced questions of a Super Bowl hangover by starting the season 3-0. Well, those questions are no longer questions; they are statements of fact. The Falcons have been unable to pick up the pieces from last season's collapse; they are now 3-3 with losses to Buffalo, Miami, and New England. Carolina Panthers (+225) - Going in the same direction as Atlanta, Carolina once led this division-and the entire NFC-at 4-1. Cam Newton and company, however, have lost two in a row at the hands of Philadelphia and Chicago. The Panthers were especially bad against the Bears, scoring a grand total of three points. Tampa Bay Buccaneers (+1400) - If there is any good news for the Buccaneers, it's that they are not as far back in the standings as they are in the odds. With no team pulling away, a 2-4 record leaves them just two games behind New Orleans. Tampa Bay, though, has lost three straight games and has allowed 68 points in its last two. Cleveland Cavaliers (+150) - LeBron did what he set out to do upon returning to the Cavaliers, and that was deliver a championship to Cleveland. Thus he sounds open to bolting his hometown team for a second time. But it's not a done deal. The Cavs clearly remain an NBA force and are once again heavy Eastern Conference favorites. Los Angeles Lakers (+275) -The Lakers have just about all the tools with which to land LeBron: money, location, and a plethora of young talent. Los Angeles probably won't be any good in 2017-18, in which case another lottery pick would be headed its way. L.A. would not be a bad spot for LeBron and Lonzo Ball to build their brands together. Houston Rockets (+500) - This is basically the era of the big three in the NBA. Oklahoma City has Russell Westbrook, Paul George, and Carmelo Anthony to compete with Golden State's Stephen Curry, Kevin Durant, and Klay Thompson. Will Houston soon counter with James Harden, Chris Paul, and LeBron? Minnesota Timberwolves (+1000) -Like the Lakers, the Timberwolves can lure LeBron with plenty of young stars on the roster. Minnesota is currently led by Karl-Anthony Towns and Andrew Wiggins, and they also signed former Chicago star Jimmy Butler this past offseason. San Antonio is a +1200 fifth choice. Emmanuel Macron (+125) -The 39-year-old became France's youngest President in history when he took office in May. Macron did so after winning a heated election against far-right politician Marine Le Pen. For whatever it's worth, Macron is married to someone 24 years his senior and he has black lab named Nemo. Donald Trump (+300) -Like it or not, Trump is the President of the United States; and the President of the United States is always going to be in the mix for Person of the Year. Trump's golf game (or lack thereof) is not the reason, to be sure. He moves the needle to even greater extent than LaVar Ball, which is saying quite a lot. Angela Merkel (+400) -Merkel is the Chancellor of Germany and has been since 2005. Forbes has named her the most powerful woman in the world on 10 occasions. Merkel, whom Hillary Clinton recently called her "the most important leader in the free world," was not congratulated by Trump until four days after her recent reelection. Colin Kaepernick (+700) -It's not often that an athlete is a Person of the Year candidate without stepping on the playing field a single time. But it was Kaepernick who started the NFL's kneeling movement. Other athletes: Conor McGregor is +1600, Tom Brady is +2000, Serena Williams is +2500, and Zlatan Ibrahimovic is +10000.